Since my copy of this book does not come with a picture cover, I was unable to provide a scanned image. Greg Weir, however, has scanned his copy of this book and sent the scan to me. Thanks, Greg! A MIGHTY TASK faces Tom Swift Jr. in his exciting, new project - colonization of the moon. To accomplish this astounding feat, Tom must perfect his latest invention, the matter maker, which will be essential for life on the moon. Not only must this amazing solartron manufacture oxygen and fuel, but also food and other materials in sufficient quantity to support the moon pioneers for some time. From the moment the young scientist-adventurer starts planning for this daring venture, danger and mysterious happenings plague almost every step of his progress. A crushing blow comes when he discovers that one of the solartron's precious secrets has fallen into the hands of an unscrupulous scientific group. Unwilling to admit defeat, Tom and Mr. Swift proceed to their Outpost in Space to conduct crucial tests on the matter maker. Just as success seems assured, the young scientist suffers the most devastating blow of all when his father mysteriously vanishes in the dark void of endless space. Frantic, Tom instigates a search that leads to the farthest planets. As you read this taut, nerve-tingling story of Tom's exploits, you will live every tense moment of his triumphs and electrifying adventures. How did the Space Solartron work? Before I forget: when I first posted this summary, I was completely, totally, absolutely wrong in my explanation of the mass/velocity matter. I discovered my rather serious error when a person named Larry Smith sent me a letter explaining my mistake. Thanks, Larry! What does relativity have to do with Tom Swift? Well, when the authors of this book heard this mass/velocity principle, they thought that they could use it to create matter. The principle would be simple: all you would have to do is accelerate an atom in a particle accelerator until its mass started increasing enormously. Then, when you had all the mass you wanted, you turned off the machine and voila! you have instant mass. This will not work (the atom's mass will return to normal when you slow the atom down), but it does make a good book. "Power failure in the wind tunnel!" "Hey, the presses have stopped in the metal-stamping department." Excited voices blared out over the loudspeaker in Tom Swift's private laboratory at Swift Enterprises' vast experimental station. The telephone was jangling shrilly. A lanky, blond youth of eighteen with deep-set blue eyes switched off his experimental equipment and scooped up the receiver. "For Pete's sake, take it easy, skipper!" gasped a voice at the other end of the line. "You've popped the main circuit breaker!" "The load's off," Tom reported. "I just stopped my experiment." As he hung up, a husky dark-haired youth burst into the laboratory. "Hey, what's going on, genius boy?" Bud Barclay demanded. "Are you trying to sabotage this place?" Tom grinned wryly. "Relax, Bud. I was just running a test on my new matter-making machine. I arranged with the power plant to cut in the stand-by generator, but even that wasn't enough to handle the current load." Bud slumped down on a lab stool and mopped his forehead. "Whew! I thought someone was blowing up the joint! Even the radio tower started to--"
Suddenly his voice trailed off and he stared at the young inventor. "Did you say a matter-making machine?" Tom chuckled at the surprised look on his friend's face. Bud Barclay was his closest chum and acted as copilot on Tom's air and space flights. "That's right, pal," Tom explained. "This pilot model rigged up on my test bench is designed to turn electrical energy into matter." Bud shook his head. "Man, that'll be a better trick than pulling a rabbit out of a hat. You'll be making something out of nothing!" "Not exactly." Tom grinned. "You wouldn't call an atomic explosion nothing, would you?" "I'd say it's nothing to fool around with," Bud quipped. "Why?" "Well, with atomic fission, you're turning matter into energy. This setup does just the reverse. Both cases depend on Einstein's famous equation E = mc2, which means that energy and matter are interchangeable. They're simply two different forms of the same thing." Bud scratched his head thoughtfully. "Like water and ice, I suppose. Sounds good, but how do you do it?" Tom grabbed a pencil and paper. "It's quite simple, really -- at least the idea is simple. Einstein has shown that as matter approaches the speed of light, its mass increases. He worked it all out in this one little equation." As Tom's pencil flew over the paper, Bud gulped. "You call that one little equation, pal? Looks like a whole night's homework in math to me! Keep it simple, please." "Okay." Tom laughed. "What my new invention does is take a particle of matter and whirl it around faster and faster until it's going almost at the speed of light." "And the faster it goes, the greater its mass?" Bud asked. "Right. In my experimental rig, the results only show up as a slight increase of mass on this platinum screen that I'm using as a target. But I'm building a new model which I hope will produce enough matter so that I can actually weigh it." "Wonderful, processor!" Bud exclaimed, slapping his pal on the back. "But what's this machine for -- a scientific magic show?" "No," Tom replied. "It's to help us explore space -- perhaps colonize the moon." Bud's eyes grew round with excitement. "Now you're talking my language, skipper! Give me the low-down!" "Well, on the moon, or when we're traveling through space," Tom explained, "we'll be cut off from our source of supplies. If this machine could produce oxygen, water, maybe even fuel and food, then we could exist away from the earth as long as we wanted to say." "Wow!" Bud bounced off his lab stool. "That means we could really explore space, Tom -- even visit the farthest planets!" The young inventor nodded, grinning. "Exactly. But don't get your hopes up too soon, pal. My machine isn't perfected yet, and I'll need a lot more power to carry out my experiments." "Where do you want the pots hung, skipper?" the foreman called down, jerking his thumb toward the transformers. "Mount them on the roof," Tom called back. "I'll take over form there." "You'll have a regular substation here," Ted commented. "What's the setup?" "These high-tension lines will bring in 10,000 volts from the powerhouse," Tom explained. "and the transformers will step that down to 480. You see, my work will require low voltage, but very high amperage." While the linemen were busy erecting the transformers, Tom went into the laboratory and began setting up the first model of his matter-making machine. Bud and Ted watched, fascinated, as the young inventor worked dexterously. "Let me see," Tom muttered. "Electromagnet -- okay. Castings -- check." He turned and glanced at his blueprints. "Vacuum system -- then the electronic controls." "How does he do it?" Ted muttered to Bud. They gaped in awe as the machine gradually took shape. A dome about two feet in diameter was supported on a column above a broad circular housing. From this, pipes led to the vacuum pump. The controls were enclosed in a separate console studded with knobs, dials, and oscilloscopes. "Boy, I'd sure hate to have to trouble-shoot this little gadget!" Bud wagged his head. "Sort of a miniature atom smasher, isn't it?" Ted asked. "Works on the same principle," Tom explained, "but a better name would be a particle accelerator. An atom smasher uses high-speed particles to bombard a target and cause artificial radioactivity. This machine speeds up the particles just to make them increase in mass." "And this housing at the bottom is the particle racecourse?" put in Bud. "Might call it that." Tom chuckled. "The racecourse is actually an electromagnetic field provided by the magnet. We also have to create a vacuum, so that the speeded-up particles don't go bumping into any air molecules." "Suit yourself." Tom smiled. "Here goes!" He closed the switch, feeding power to the machine, and adjusted the control knobs. There was a steady hum of current as the machine throbbed into action. To everyone's relief, the cooling apparatus did its job effectively and the aluminum bars stood firm. Tom settled down to tending the dials in silent absorption. Bud, Ted, and Chow watched in fascination as an hour, then another, went by. Finally, they left to attend to other tasks. To everyone's amazement, Tom continued to run the machine throughout the night and into the next day. He broke off his vigil only long enough to eat a few bites of the hot, tempting food which Chow brought him at intervals. It was late afternoon of the next day when Tom finally called a halt, after operating the machine to the limit of its capacity. Thirty hours had elapsed since the start of the test! Bud, Chow, and Ted rejoined Tom and gathered around to watch in fascination as he drew off a tiny quantity of gas. He analyzed it in the Swift spectroscope, then measured its mass on a microbalance. Bud saw the young inventor's face burn bleak. "Failure?" he asked. Tom shook his head. "Not exactly, fellows. ButÖ" His voice trailed off in discouragement. "What's wrong, boss?" Chow anxiously asked Tom. The young inventor smiled wanly. "A million watts of electrical energy! And all my invention produced was this measly amount of gas!" "But the spectroscope shows that it's pure oxygen," Bud spoke up. "Yes, which weighs up to exactly one one-thousandth [0.001] of a gram!" Chow pushed back his ten-gallon hat and scratched his balding head. "Reckon that ain't very much, eh?" "About enough to keep a flea alive for half a second." Tom whipped out his slide rule and did some rapid figuring. "Chow, with the power I used to make this much oxygen, you could run your toaster an hour a day for eighty-one years!" How feasible is it to build a Space Solartron? Well, first of all, you couldn't do it the way Tom Swift explained it. His idea of speeding atoms up and then slowing them down when their mass increased just wouldn't work -- when you slowed the atoms down again your extra mass evaporates and you are left back on square one. However, that doesn't mean it is impossible to create mass from energy. A few decades ago a group of scientists got together and created a few atoms from solar radiation -- that's sunlight, by the way. The process used an incredible amount of energy, but it did work. It's the amount of energy required that is really the death knell of a Solartron. You see, even if Tom Swift had built a device that could turn sunlight into matter, the amount of matter he could create is negligible. 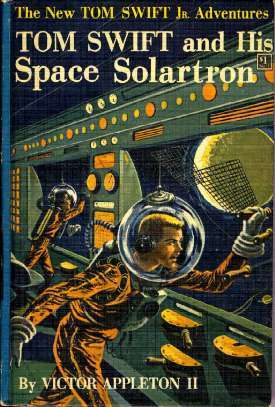 I have calculated that, with Tom Swift's 40 acres of solar panels that his Solartron used, he could create 0.4 grams of matter per second -- which is not very much. Oh, sure, if you were to move the Solartron closer to the sun more mass would be generated, but then its whole purpose (enabling men to explore the outer planets) would be defeated. However, there is one other possibility: a nuclatomizer. A nuclatomizer (which is discussed more fully in the Dig Allen book Journey to Jupiter) is a device that can turn any kind of matter into any other kind of matter. To put it another way, it could take ordinary rocks or garbage and change them atomically into oxygen, water, gold, or whatever you want. Such a device, I think, would fulfill Tom Swift's purpose. How much impact would a Solartron have on civilization? A device that fulfilled the promise of Tom's Solartron would have enormous impact in a wide range of fields. Think about it for a minute. What would it mean if you could create an infinite stream of mass from sunlight (or, in the case of the nuclatomizer, from rocks)? Mines, of course, would go out of business -- after all, why go through the trouble of mining the ground if you can get coal, gold, and silicon straight from the sun? The international gold market would fall too, since gold would theoretically be no rarer than steel. In space there is great promise as well. Fuel and food supplies would no longer be an issue on long voyages -- just take a handy Solartron or nuclatomizer and you're set for life. Repairs, too, would not be a problem in an advanced model Solartron -- just type in what part you want and the computer could manufacture it for you on the spot. (This could affect manufacturing too, by the way -- imagine if you could create a new car or house for yourself with the press of a button!) Outer space could be easily reached at last. Colonies would spring up on all of the planets, since the last great barrier to space colonization would be broken down.